HTC R7 and R12 following Windows update? HTC is reportedly preparing to launch its first Windows RT tablets once Microsoft launches the long-awaited Blue software update, and judging by today's rumours, the machines look like a pair of beauties. According to a PhoneArena tipster, the Taiwanese company is preparing two high-end tablets, the 7-inch R7 and the 12-inch R12 for launch later this year. The R7, the source claimed, could bring a full HD, 1080p display and will be powered by a rather sizeable 2.3GHz quad-core Qualcomm Snapdragon 800 and 2GB of RAM. The device may also tout a 13-megapixel camera, 16GB of internal memory plus a microSD card slot, along with a Bluetooth 4.0 and a 4G LTE radio. 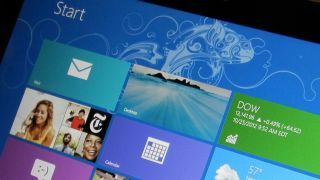 If the speculation proves to be genuine, the HTC R7 (with the R presumably named after Windows RT) would be among the first of a new generation of 7-inch Windows tablets. The new Windows Blue update, which Microsoft plans for release later this year, is expected to relax specification requirements, allowing for smaller Windows RT tablets for the first time. Beyond the R7, the HTC R12 is reported to be touting all of the same core specs along with a few more connectivity options, plus a super hi-res 2048 x 1536 display, which would match the iPad's Retina display. The report claimed both tablets have been slapped with a tentative launch date of Oct. 13, but we'll be on the look out for firmer facts about these gadgets.